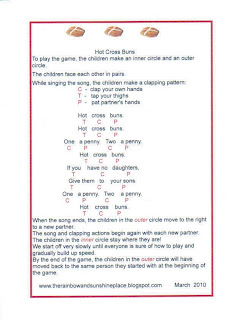 Rainbow Class and Sunshine Class have been learning the song Hot Cross Buns. While singing, they've also been learning to play a clapping game in two circles! To play the game, the children make an inner circle and an outer circle. The children face each other in pairs. One a penny. Two a penny. 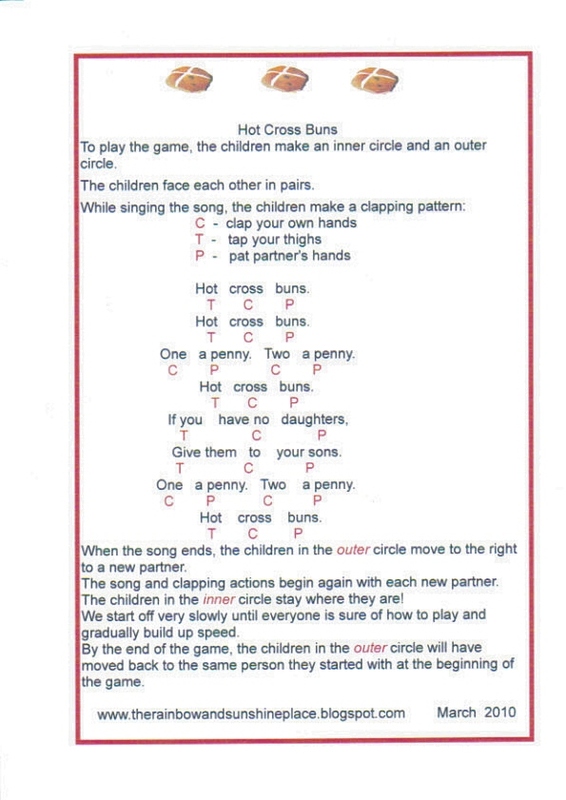 When the song ends, the children in the outer circle move to the right to a new partner. The song and clapping actions begin again with each new partner. The children in the inner circle stay where they are! We start off very slowly until everyone is sure of how to play and gradually build up speed. By the end of the game, the children in the outer circle will have moved back to the same person they started with at the beginning of the game. Click on the picture below to open in a new window then print. This game is lots of fun and a firm Rainbow and Sunshine tradition thanks to Mrs. George! We've been for a walk to the bakery this week to buy a hot cross bun to eat at snack time. Each child paid for their own bun. We are learning about money as well as Easter traditions!